Under certain soil conditions, e.g. hardsetting clay B-horizons of South-Eastern Australia, wheat plants do not perform as well as would be expected given measurements of bulk soil attributes. In such soils, measurement indicates that a large proportion (80%) of roots are preferentially located in the soil within 1 mm of macropores. 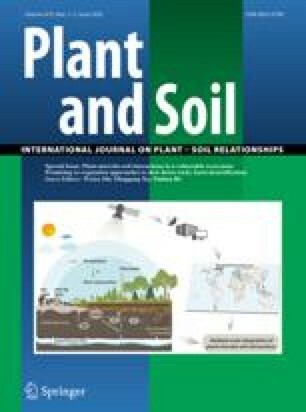 This paper addresses the question of whether there are biological and soil chemical effects concomitant with this observed spatial relationship. The properties of soil manually dissected from the 1–3 mm wide region surrounding macropores, the macropore sheath, were compared to those that are measured in a conventional manner on the bulk soil. Field specimens of two different soil materials were dissected to examine biological differentiation. To ascertain whether the macropore sheath soil differs from rhizosphere soil, wheat was grown in structured and repacked cores under laboratory conditions. The macropore sheath soil contained more microbial biomass per unit mass than both the bulk soil and the rhizosphere. The bacterial population in the macropore sheath was able to utilise a wider range of carbon substrates and to a greater extent than the bacterial population in the corresponding bulk soil. These differences between the macropore sheath and bulk soil were almost non-existent in the repacked cores. Evidence for larger numbers of propagules of the broad host range fungus Pythium in the macropore sheath soil were also obtained.